I had a difficult conversation with a potential client this month. The man has some unique and valuable collectables that he no longer enjoys, and he would like to instead enjoy the money from selling them. He also decided that he wanted to offer the goods via a Dutch auction where the prices start high and are periodically dropped until someone buys or a reserve limit is reached. He and I discussed what he had to do to get ready to display his items, and he described the type of site that he thought would best show off his goods. He also admitted that he had a very limited budget, at least until some of the articles sold. I said that I would research Dutch auctions to see what support there was available on the Internet for such a site. In considering his site, I was really concerned about getting enough traffic so there would be bidders for the goods. I worried that even a gorgeous, feature-rich site which had been tuned for search engines still would not capture many visitors. There wouldn’t be enough potential bidders for a successful Dutch auction, particularly because the items for sale were specialty, expensive collectables. I spent some time researching Dutch auctions, Dutch auction software, and sites that ran Dutch auctions. I was focused on finding a way to boost traffic for the potential site. I found a Dutch auction service that allowed individuals to set up stores within it, and each store could run its own sales and they would be listed in the overall auction directory. The main online page was a bit cheesy, but it looked like you could customize your store and have your goods show up on a shared index. Exploring a customized Dutch auction store on this service was my recommended course of action for the client. The service had built-in features to display products for sale, it was inexpensive, it had some measure of built in traffic. I suggested that he contact some of the other virtual store owners — ones not selling competing items — and see if they were satisfied with the service. The potential client didn’t want to go with my recommendation. Instead he wanted me to create the customized site he envisioned. The store owner had too many conflicting constraints and wants: low cost, customized storefront, lots of visitors, no budget for Google AdWords, complete operational control. He didn’t want to settle for the solution I thought was possible for him. That is absolutely fine. But, in my heart I was convinced that I could not make him happy. And, that’s exactly when you don’t want me to work for you. When you or I or both of us feel that you ware not going to be happy with what we do together, you shouldn’t hire me. When you publish a one-page website that functions as an online business card you have a critical design challenge. You’re publishing one page that has to do the work of a whole site with many pages. I recently published a site conceived and designed by a client that does a great job announcing the business on the Internet. Who, what, and where are explicitly explained in headlines. The “what” and “why” are made obvious by the left-hand panel which slowly rotates through a series of photographs of cocktails and happy people. The slow slideshow skillfully enhances, rather than distracts, from the site’s message. In addition, the page gives visitors a way to get more engaged with the business with links to its Facebook page, Twitter feed, photos on Flickr, and YouTube videos. My hat is off to John of Bacchus Waikiki’s brain trust who laid out and gave me the specifications for the page and also provided most of the text. 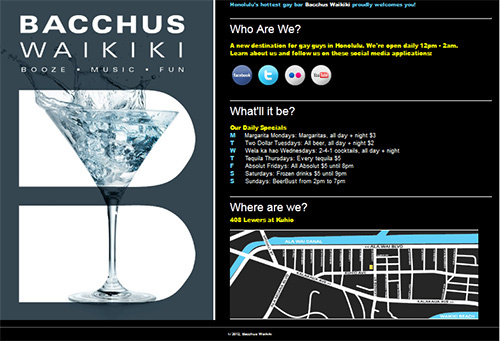 Check out Bacchus Waikiki’s site yourself. 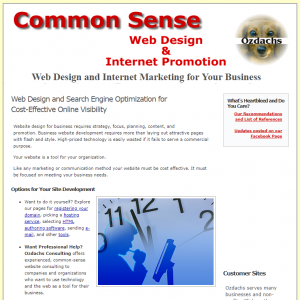 In my opinion, web design should include optimizing the pages for search engines. There should be no need to employ a second professional to make a site show up in search results. But, apparently most web designers consider search engine optimization something separate from site creation. Just last week I worked with a local caterer whose professionally developed site was invisible on Google and other search engines. I am beginning to understand how business that specialize in Search Engine Optimization can make money. The original designer had put up a fine looking site, but there were no words on the site to tell Google what the pages were about. I take that back: every page had the same title with “catering” the third word of the page title. But, that was it. The site mentioned the type of events the business catered, like weddings. But the word “catering” was not emphasized in the visible text on the pages. None of the images had ALT tags — HTML code that describes pictures for the visually impaired and for search engines — with the word “catering”. So, as far as Google was concerned, the site could have been about “wedding chapels” or “wedding planners” or “wedding dresses”. Maybe the site could have been in results “wedding food” or “wedding chef”, if anyone searched for those terms. But, for “wedding catering”, the site was not going to show up. We also decided to try to show up when people searched for “Marin” and the catering terms listed above. Our changes went online Monday, and the search engines have started to respond. Google already lists 3 terms in its top 10 results, 5 in the top 20, 7 in the top 30, and 10 in the top 100. This morning I tweaked some pages to help more terms, and we’ll be monitoring this first round of optimization for the next couple months. Real people are starting to notice the site, too. Before the site was updated, we tracked visitors for a few days and saw that no one came from searches for “catering” on the Internet. When anyone used Google to find the site, they searched for the business by name. 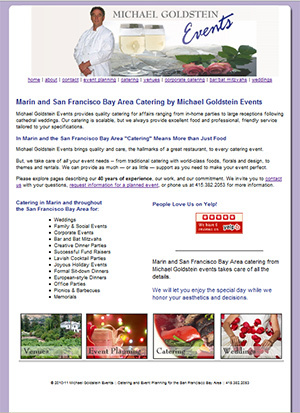 So, they weren’t looking for catering services, they were looking for Michael Goldstein Events catering. When I looked at the statistics this morning, some people had come to the site after checking Google for “catering” or “Novato catering”. It’s just a trickle of visitors at this point, but it’s a start. I remain surprised that so many web designers can publish sites for business clients that don’t appeal to search engines. When I create a new site for a client, I don’t charge extra for optimizing the site for visibility on Google. I incorporate good search engine techniques as part of making the overall design. I think all web designers should do the same. But, until they do, I’m happy to help businesses with under-performing web sites get into search engine results! Web Design, Search Engine Optimization, Data Backups, and Other Topics. Huh? The grouping of ideas illustrates exactly how too many web designers approach a new site. Web design is one topic and optimizing the site for visibility on search engines is another subject all together. Of course, one of the purposes of most business web sites is to attract new clients who stumble across the web site by searching Google or Yahoo or Bing or somewhere. But, designers and their clients too often create a web site without focusing on the site’s purpose, getting new clients. The new site is structured without thought to showing up in search engine result pages. In fact, the new site may be difficult to modify to add search engine friendly text, graphics, or tagged information. The problem is more broad: in today’s world of hyper-specialization, the creation of web sites has been deconstructed into too many discrete tasks, each lorded over by a guru who is quick to say that this or that aspect of a web site simply isn’t in their field. There are the designers for the look of the site. There are usability experts. There are functionality designers who are distinct from coders that implement the functionality designed. And, different from all these experts is the search engine optimization analyst. All of this specialization might be reasonable in a design project team for a major corporation. For 90% of small- and medium-sized businesses, the tunnel-vision specialization is detrimental. Most businesses want to sit down with their web person and have the one expert create an Internet presence that will meet the commercial needs of the business. 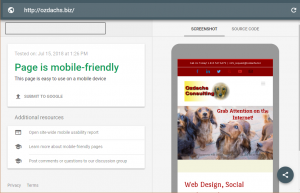 The business owner doesn’t expect to talk to one person about the site’s look, another about its friendliness to users, and still another person about placement in search engine results. The owner wants a general contractor who will build the site. At best, separating the topics of web design and search engine optimization is another sign that the Internet is coming of age. It now supports a bureaucracy, or at least a Curia. It won’t be long before there are Search Engine Optimization college classes and technical certifications — if there aren’t already. But, I question the awkward division of the unified task of web site development. Most businesses cannot afford a web site project staffed with specialists and, I suppose, coordinated by a project manager. The businesses need a single web designer who takes into account visual appeal, usability, search engine optimization, and all other aspects of the site. I enjoy seeing a business owner look over a new site that we created together. One where I may have even taken some of the photographs while designing the pages and tuning them for showing up in Google. My customers cannot afford an army of Internet technicians working on their site. And, they don’t need one so long as we remember the business goals of the business web site. So, I suggested to my colleague that I would be happy to give a presentation on web design that would include tips on search engine optimization. We’ll see what he says.